Tomorrow is the final ferry of the winter timetable, Friday sees the start of the summer ferries with more ferries per week and longer day trips to visit Rum. The clocks went forward at the weekend and while I confess to not waking early enough to notice any morning difference I am certainly enjoying the extra hour of daylight at the end of the day. As I type it is pouring with rain but it’s the first in a week or so and after days and days of glorious sunshine I’m even feeling cheery about the heralding of April showers it signifies. Loads of my seedlings are sprouting and I have four more raised beds to finish weeding (leftover laziness from last year when I failed to get round to clearing them in time to mulch which I am seriously regretting having seen how fabulous the earth is beneath the mulched beds. 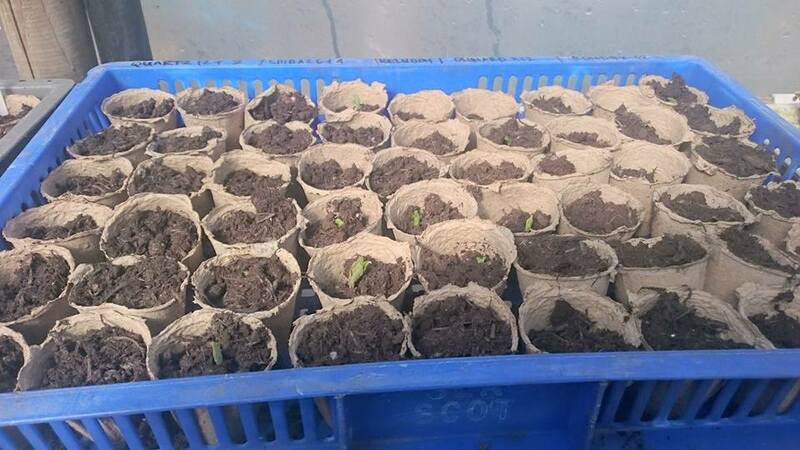 I’ll start to harden off the seedlings over the coming weeks leaving them outside of the polytunnel for longer and longer periods until they are ready to plant out. I’ve also sown some carrots in pots and some flower seeds outside in tubs too. I never really plant flowers other than edible or medicinal value ones but I had ten or so packets of seeds that have come free with horticulture magazines, as promotional gifts or been given by friends so I decided this year I would plant flowers too, for the bees and for the prettiness! 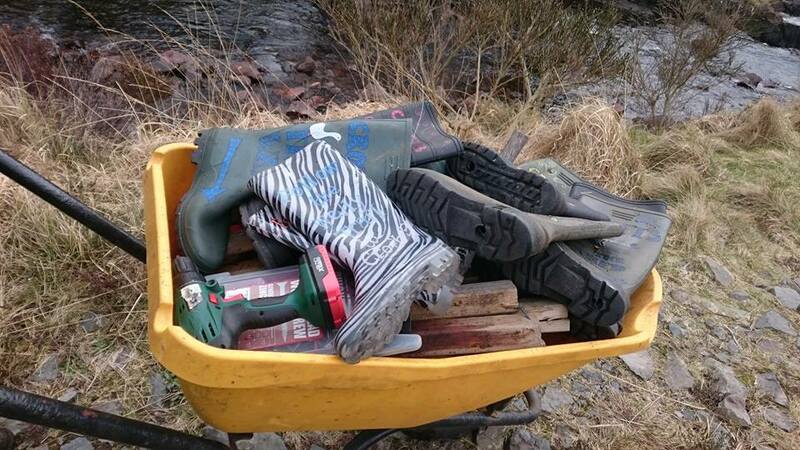 Ady and I spent a happy morning armed with a wheelbarrow full of painted wellies, the drill, some posts and a hammer wandering around the village refreshing, adding to and enhancing the welly trail to Croft 3 which we set up last year. We’ve already had our first customers of the year buying jam. 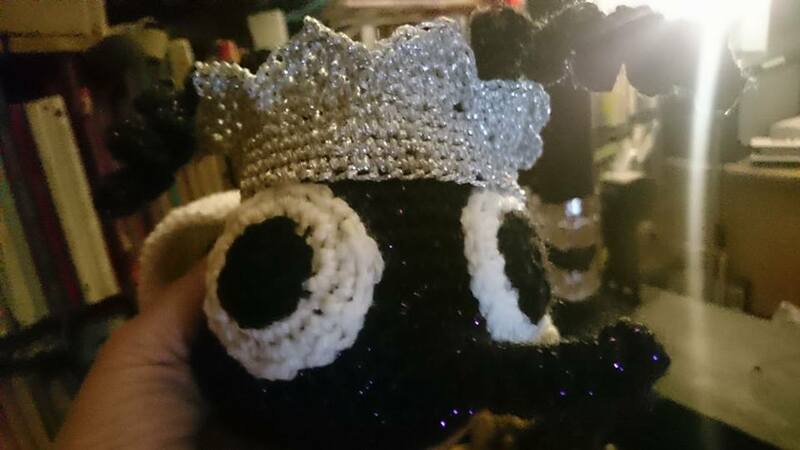 Queen Midge is in residence and I’m working on some freeform crochet hats while waiting for some craft materials I need for my next planned line. While on the subject of growing Sunday was a lovely day. The sun shone, a friend visited with her wee son, Rum’s youngest resident, who had a great time bouncing on the trampoline with Davies and Scarlett. 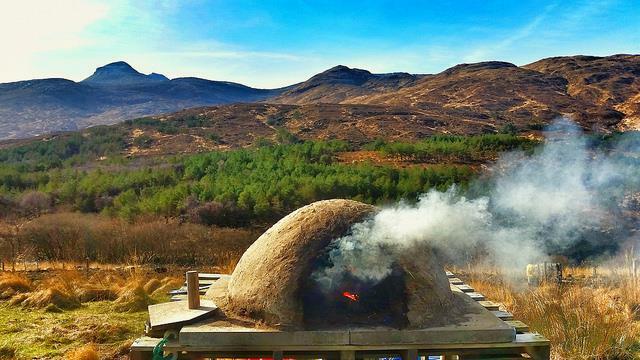 We had the most delicious dinner of roast pork – a pig we reared, butchered and processed here on Croft 3, cooked outside in our cob oven, built by us and fired with wood we cut and gathered ourselves. It was Mothering Sunday here in the UK and I had the most wonderful cards from Davies and Scarlett, the wonderful, amazing people I had a hand in growing. As I said in an earlier post we are continuing to live in the present. 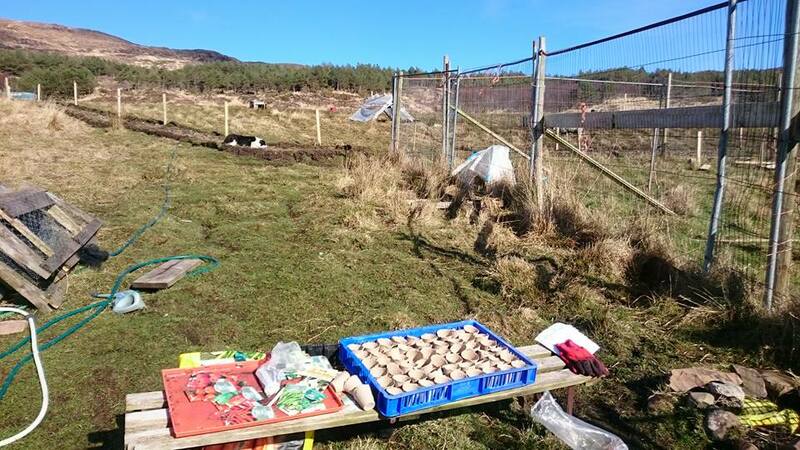 Despite the intention to head away from Rum at the end of this year for now we are making the most of nature and our current location and getting on with the usual spring activities of sowing seeds. 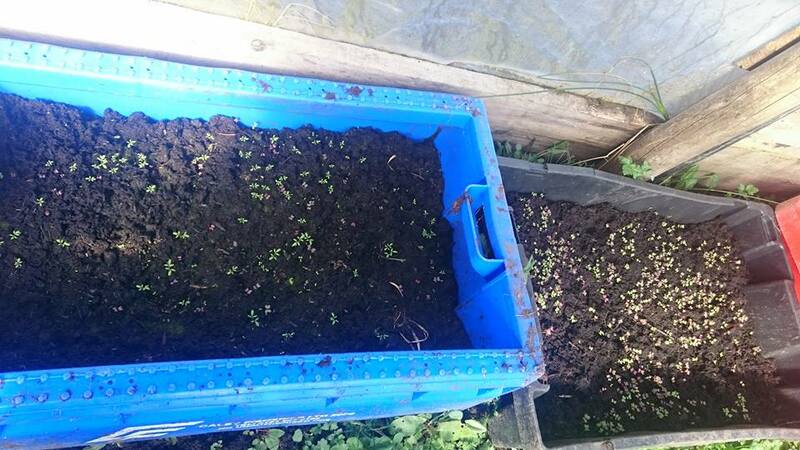 I’ve had a couple of big sowing sessions down in the polytunnel and mini greenhouses and the first signs of germination are poking their heads out from their compost blankets. 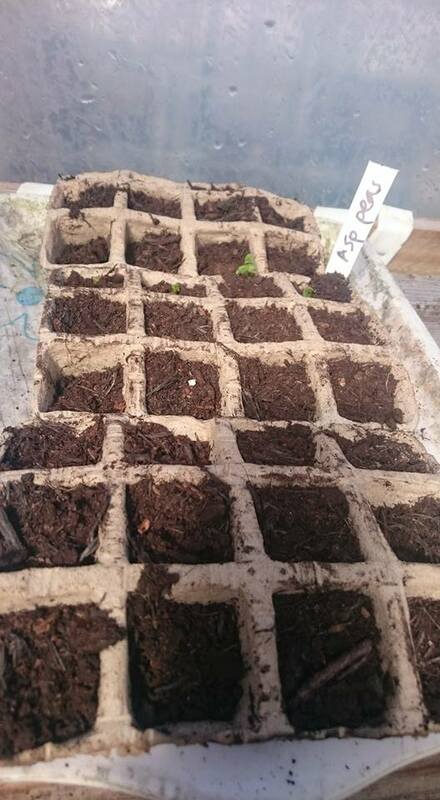 I’ve sown a whole load of crops: onions, garlic, potatoes, artichokes, cucumber, celeriac, peas, beans, strawberries, chillies, peppers, tomatoes, leeks, asparagus, borage, courgettes, oregano, basil, parsley, sage, coriander, cabbage, broccoli, beetroot, chard, kale, squash, parsnips, rhubarb and salad leaves. 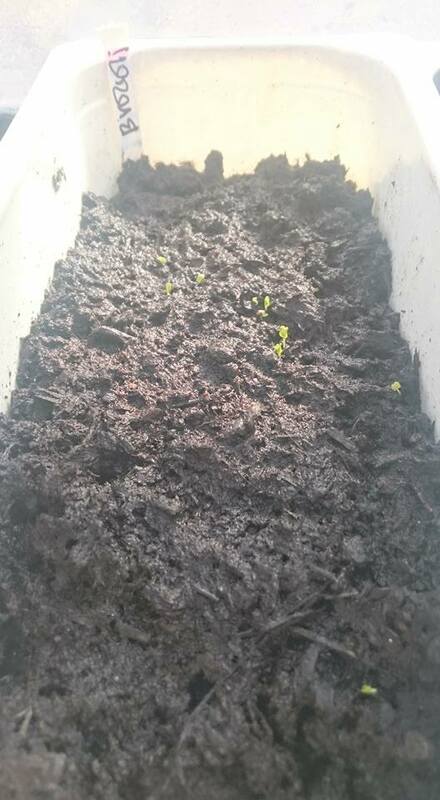 Sure enough the speedier germinating seeds are already sprouting. And of course every queen deserves a crown! 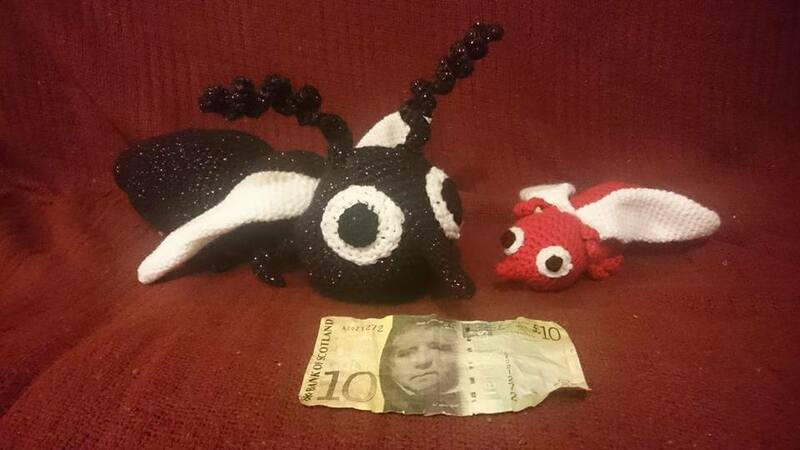 I’ve been pondering another couple of new lines to add to the stock for sale in the shop too, watch this space. As you can imagine yesterdays blog post was the result of many hours of conversation and debate between the four of us over the past few weeks and months. It was in January, actually while away from Rum which is often the best place to gain perspective – outside of the environment or situation you are pondering that we came to the decision to begin leaving our current life, at least for a while. As an individual I have always considered myself to have a pretty short attention span which has butterflied me from job to job in my early adulthood. When we told a friend (previously a boss at work actually) that we were considering not sending Davies and Scarlett to school she laughed at me and said ‘Of course you are, why would you ever do anything just because everyone else does it?’ And she was right. We always question and challenge what we’re doing and why we’re doing it that way. We constantly re-evaluate if it is still working for us. That could sound exhausting and foster a low level feeling of instability but it is done within a framework of a very secure family with constants of our relationships with each other and a whole load of researching and considering options before actually making any rash moves. Despite the unconventionality of our lives – home educating, a year travelling with young children, a move to a remote island, now a plan to do something else, all of these have actually been thought out, carefully planned choices that have worked really well for us. The early months of this blog were all about the planning and decision making process behind our WWOOFing adventure. To me it feels far riskier and irresponsible to not take ownership as much as possible of the direction of your life, to heedlessly follow where others lead without checking in with yourself regularly as to whether this is making you happy, meeting your needs, ticking your boxes. I should state here that this is what works for me, what works for Ady and why he and I are such a good team and what has worked really well for Davies and Scarlett who inevitably share our world view but are very capable of challenging and questioning and having clear opinions and ideas of their own (not to mention very used to having them heard, taken seriously and acted upon). I know that others have their own guide through life, their own paths to tread, their own philosophies on how they make their choices and are perfectly happy and content. I am in no way judging or dictating, merely recording how we go about our personal brand of dice rolling. Last year was a really tough one for the four of us, by our standards. It started with Ady in hospital, followed up with the loss of a pig and subsequent loss of an unborn litter that pig had fathered. 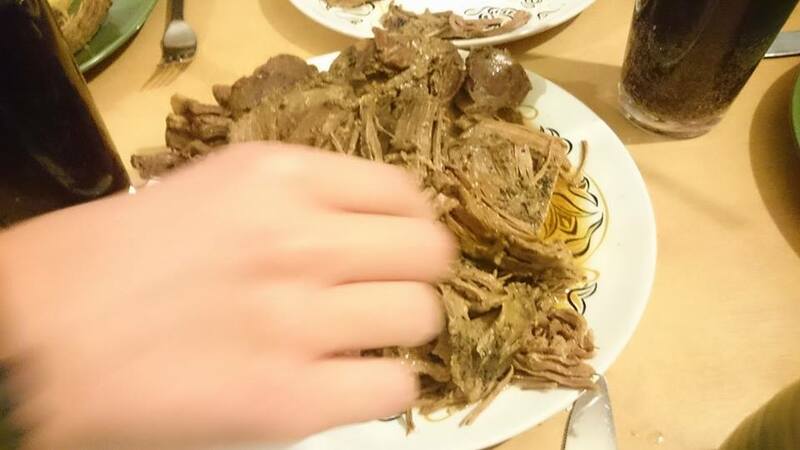 A rash and un-thought out rehoming of two more pigs really didn’t work out well for us. Difficult times for several of our extended family which we were simply too remote to help with really tested our commitment to living so far away. The bad start to the year never really managed to pick itself up. The positives of our life here were for a lot of 2016 overshadowed by the negatives. We talked often of leaving, of whether this was still working for us and more often than not at least one of us was ready to start talking about the next step. But we collectively agreed that our life here was still, on balance meeting most of our needs. We even quantified it and decided that we had about 80% of everything we wanted which we felt was pretty good going. I have been accused before of painting an unrealistic idea of what life here can be like – it is true I am very much an optimist but I genuinely do see the best in life and am very aware that all choices involve compromises and that choosing to focus on the good rather than allow the bad to be overwhelming is what makes for contentment. We felt that 20% of our needs not being met was acceptable and worked towards finding ways to meet them better – more regular trips off the island, finding ways to take responsibility for creating the opportunities we felt were lacking etc. I’m not at all keen on the ‘If I won the lottery / ruled the world / could make up all the rules’ type thinking and as such we decided not to talk about what we do if we left Rum because I think as soon as you start investing energy and imagination in something other than what you are actually doing right now you might as well be investing properly in it and making it happen rather than speculating on it. But once we had decided that Rum was no longer working for us we began talking about what we wanted and trying to work out what our next step might be. * A regular social life and being able to hang out with friends in real life. * More privacy – a different space to hang out with friends or watch / listen to something or just spread out my stuff. * Drumming. I’d like to have lessons. * The equipment and resources for film-making and access to a film-making course or workshops. * Being able to decide to buy something and just going out and getting it the same day. * Enough space to keep chickens and ducks. Water for the ducks in the form of a pond or river, an indoor space to rear young animals like a shed or outbuilding. * A view. I want to still look out of a window and see nature not roads and houses. * Home Educated or otherwise shared interest people nearby. I want to live close to people like me. * To be able to get involved in conservation activism or volunteering. * To find an animal sanctuary or similar with opportunities for volunteering or work experience. * Learn more about alternative energy, how to generate more power and store it. I love being off grid and want to learn more without the constraints of space and access to the resources or people who know about it. * I’d like to experiment with more obscure livestock holding – species like llamas, ostrich or alpacas. * To be able to drive up to my front door! * To have family celebrations again, like Christmas and birthdays with our wider family. * To be close to my family. Able to day trip or at least be able to get to them on the same day as I leave home. * A wide selection of food choices, particularly fruit and vegetables. * A comfortable home with private space for each of us and a larger communal space for being together. 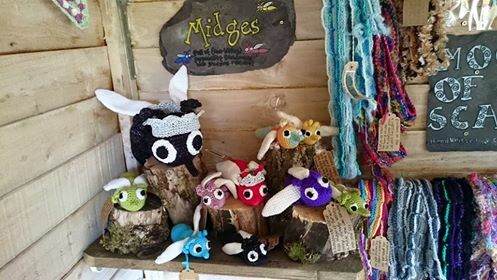 * Access to resources of all types – whether it is needing a new pair of shoes, some craft materials or a kitchen item at the moment we buy blind online, rely on good customer service and delivery charges then rely on the post and ferry to get something to us. To decide I want to buy some new jeans, go and try them on and bring them home all on the same day. * I still want to live somewhere beautiful, somewhere with a sense of community and somewhere we can grow food and keep some animals. * close to the beach or a river or other body of water. * To write, craft and talk to people and earn money or otherwise meet our material needs from these pursuits. So a real mix. Many of the items on the wish lists are what we have now and value too much to let go. 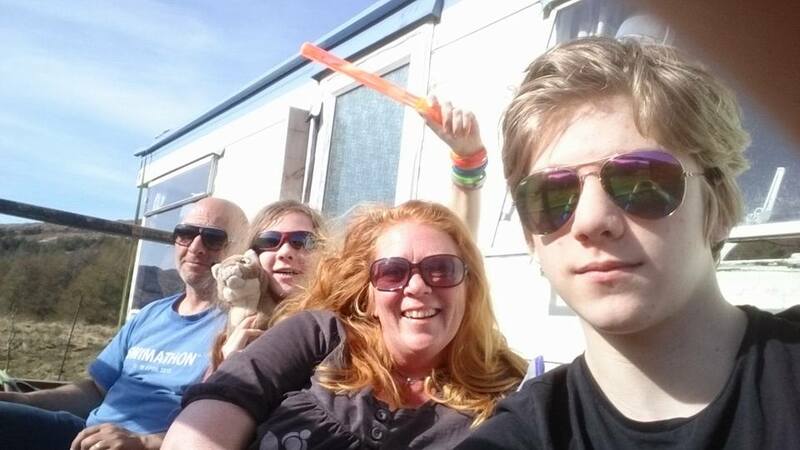 Many are practical conveniences which our five years living in a caravan on a remote island have made us crave back in our lives, a lot of them are to do with other people – a need to be closer to those we know and love or to find more people like us, some, particularly the kids are about opportunities and finding the path to what happens next. This list, much like the one we made 7 years ago will change and be added to as we think of more things which are important to us, or let go of things we are prepared to compromise on. But for now the four lists are coming together to paint a picture for us of what our life should look more like than it does now and where we can start looking to find the right place to base ourselves. The wish lists begin to give us a geographical idea of where in the world to look, what sort of location (urban, rural etc. ), what sort of dwelling we want and what sort of income we’ll need to generate between the four of us to fund it. Taking the winter off Rum will give us a chance to see how much we miss the easily met parts of our wish list from Rum and how important some of those other not at all feasible on Rum items are. Watch this space – exciting times are ahead! Nearly seven years ago after many conversations about just what we wanted from life the four of us drew up the following wish lists. It was 2010. I was 36 and spent my days as a Home Educator with a part time job at the local library and volunteer roles as a shepherd and a leader for various of the kids ‘after school’ activity groups. Ady was 45, worked full time, wore a shirt and tie, spent a lot of time on the M25 in his company car. Davies was 9 and loved drawing, films, animation and bushcraft and Scarlett was 7 and loved animals and any opportunity to get muddy! They went to swimming lessons, St Johns Ambulance Badgers, RSPB Wildlife Explorers, cinema club and regular home ed groups. 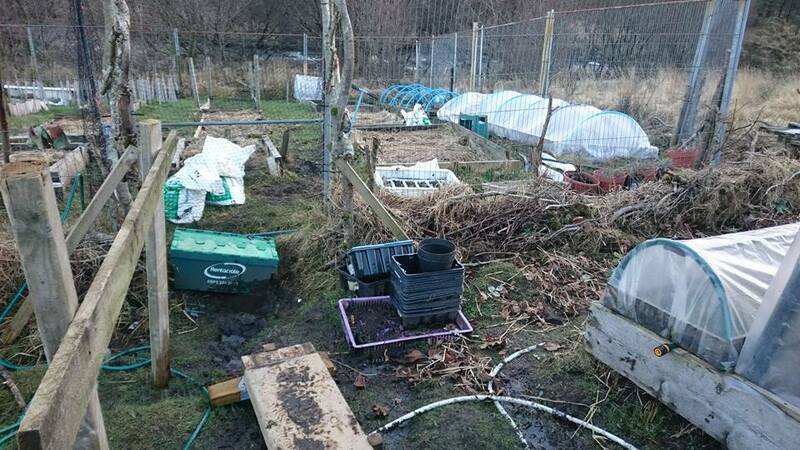 We lived in a decent sized house and had chickens, ducks and quails in the garden and an allotment a mile away. To live a more sustainable, self-sufficient lifestyle. To have all four of us working together towards providing for ourselves whilst having as many elements of our shared, and individual ambitions met. To be living our passions full time rather than indulging them in small ways around the rest of life. To be doing things for ourselves wherever possible and putting our own food on the table rather than going out to work to earn money to pay for food (or tables). To have our life be our work, our work be our life and everything rolled in together in providing for ourselves, realising our dreams and spending our days in tasks taking us towards where we want to be. No pointlessness. When I started this blog all those years ago I had no idea of quite how much of an adventure it would chronicle. How far we would come, how many of those wish list items we’d tick off, how different our lives would become. Our journey to this point has been a combination of an open minded attitude towards seeing opportunities as they arise, saying yes to exciting and scary possibilities, a willingness to learn and try new things. When I read back that list now I am struck both by how ambitious and (if I’m honest) unattainable it felt to be writing it at the time and by how much of it we have ticked off now. Our adventure took us all over the UK, introduced us to the most amazing people, taught us so many lessons, showed us some of the most beautiful and breathtaking scenery and wildlife in the UK, offered us stepping stones from one chance meeting and conversation and opportunity to the next until we finally ended up here on Rum. What could have been the end of the adventure with us finding our new home was infact just the start of a whole new one as we set about putting into practise what we’d learned, what we wanted to achieve and built a tailor made new life for ourselves from a bare field up. Our choices, our lifestyle, the way we have made decisions has been pretty unconventional. Not many 7 and 9 year olds get to write wish lists for how their life will be and have the adults in their life not just take them seriously but find ways to enable those wishes regardless of how quirky they might be. But we believe that our time as a family unit is so short before Davies and Scarlett head off on their own adventures in life that to have found a way to combine all four of our wish lists and create a life that is as close to our dream as possible has been the very best thing we could have done. Of course the wish list of seven years ago is ever changing and evolving to meet different needs, dreams, accommodate new experiences and interests. The life that we have built here on Rum which met our needs has more recently felt lacking. Rum is a staggeringly beautiful place. Every single morning when I wake and open the curtains I am reminded anew how fortunate I am to live in such a stunning place. Every walk alongside the river, every sunset, every winter frost, every spring awakening, every bramble picking autumn. It is also incredibly harsh, wind and storm battered, midge infested. Ridiculously remote, difficult, time consuming and expensive to come and go from as visitors or residents. The land is inhospitable to livestock or crops, every single triumph in both is off set against the failures, so many failures. Never will we, nor would we really want to, tame this croft to any real degree. When we arrived here we brought the resident numbers to over 40. When we leave they will dip below 20. Davies and Scarlett are the only teenagers, we are the only Home Educators, the only off-gridders. We have made some wonderful friends here, will take with us so many memories and experiences but for now Rum is no longer meeting our needs or ticking off sufficient items on our current wish list. Having realised that self sufficiency in food is not a feasible notion and that bartering and exchange will still not net us everything we need to survive we are forced to reconsider quite how we can earn enough to buy in the things we cannot grow, rear or create ourselves. Our shelter here, always intended to be temporary becomes less adequate with every passing season and ever growing children. The next chapter in our adventure awaits. In the same way as we began this blog with a sense of longing for something different and a plan to go searching for it we are intending to further hone our wish list this time and then explore all the options to find the best way to meet our needs. At this stage we feel that some perspective outside of our Rum bubble is the best starting point. A return to the mainland, a saturation in all that we have left behind and not had these last five years. We began this journey by stripping away everything and slowly adding back in the things we felt we needed. This time we plan to do the reverse and immerse ourselves back into modern life and see what we can cast off as unnecessary. Our current intention is to enjoy the spring, summer and autumn on Rum. Knowing it may be our last round of all these seasons and squeezing every last ounce of the best from them. 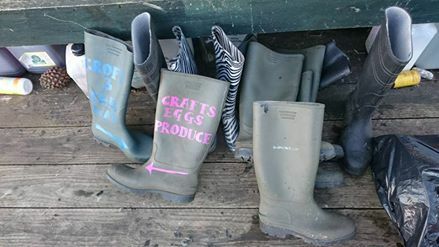 We’re growing crops, opening the shed for business, introducing new lines and looking forward to our weekly wildlife boat trips and lots of visits from family and friends. Then we will leave before the winter starts and see what happens next. At this stage our intention is actually to return to Rum again in spring 2018, to start again with only the financially viable parts of our current Croft activities and see if earning an actual living from Croft 3 is feasible. In the same way as our original plan was a 9 month WWOOFing adventure before returning to Sussex. It is easier to take courageous steps into the unknown when the door to home is still open, in sight behind you. I will continue to blog – both what is happening here on Croft 3 on Rum for as long as it remains our home, and about what happens next. The adventure is far from over! March is like the babymoon phase of parenthood here on Rum. The pain and messiness of actual childbirth is behind you and almost forgotten (winter storms, endless rain and condensation, cancelled ferries…) and the reality of newborn parenting has not yet sunk in – sleepless nights giving you a zombie like state in a constant round of nappies and nighttime feeds are still not fully making their presence felt (midges, endless questions from visitors about how many children are in the school, what you do in the winter and how you got here when you are clearly not Scottish). Instead you are there, utterly falling in love with your new baby, endlessly counting their tiny toes and gazing into their deep and knowing eyes (charmed by the cockerels crowing, the daffodils appearing, it still being light at 7pm). Yeah, so March. A nice time on Rum. 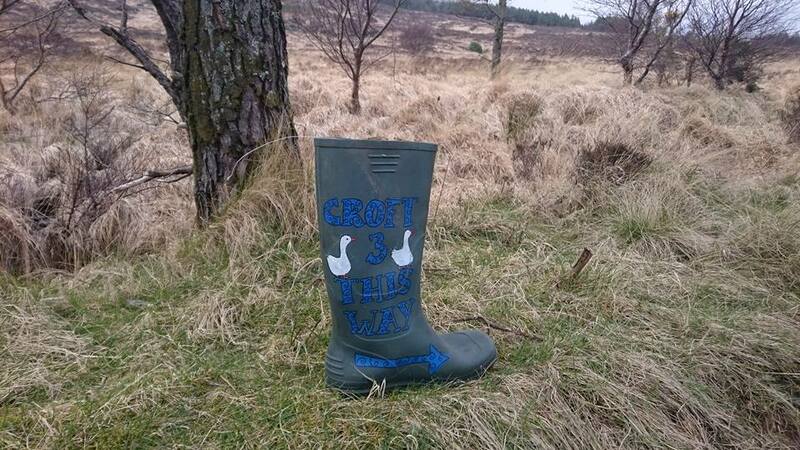 I’ve painted up all the new wellies to add to the trail. I’ve had another couple of sessions of weeding, thinning, planting and sowing. 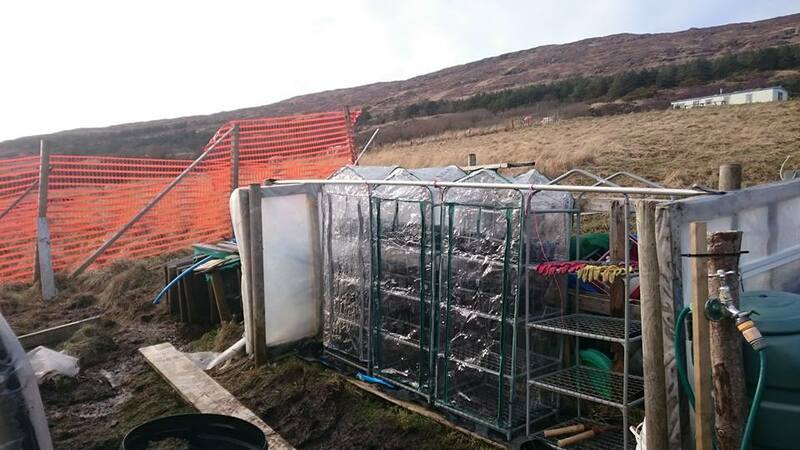 Covers are on the mini greenhouses, the first seedlings of salad leaves have already poked their heads through the soil. I spent a couple of hours in the shed tidying up, rearranging and getting everything ready to open for the season. Meanwhile Ady has been mending fences and clearing out sheds ready for making encouraging and welcoming spaces for the birds to start laying their eggs and he’s done the first cut of the season on an area o the croft so choked with reeds that it needs clearing to allow the grass to grow through and create more grazing space for the sheep and geese. Spring is well and truly in the air. Another winter over. Another winter survived. That makes our fifth on Rum. The end of February brought a monthly bring and share community meal with the theme of ‘winter leftovers’ to celebrate the impending end of that season. We took along sausages made from the pig we took through winter but really shouldn’t have done. Followed the next day by an incredibly soggy beach clean on Loch Scresort beach. I was not in the best frame of mind for this hour or so traipsing along the slippery stones in the pouring rain gathering litter from the beach I have to confess. However a combination of the company and the innate rightness of such a task did propel me into both a better mood. As did sitting infront of the log burner with a hot cup of tea once I got home. 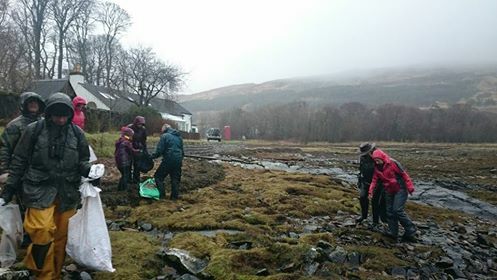 On our second day here on Rum back in 2012 we joined a beach clean over at Kilmory beach. Of the people who came along to that beach clean all but two have since moved on from Rum. The day after that Davies, Scarlett and I headed off on the ferry to the mainland. 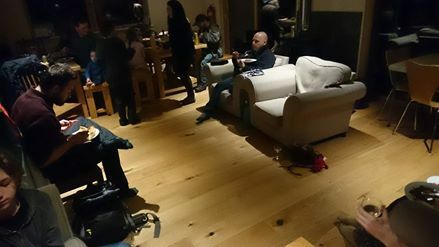 Ady joined us the next day so as to leave the animals and croft for the shortest possible time in the care of friends. The purpose of the trip was a brace check up at the dentist for Scarlett. She is a year in, and about two thirds of the way through her treatment and doing well. I am in awe of both what can be achieved by orthodontics and Scarlett’s attitude towards what has been a real diet and lifestyle altering amount of treatment. We made the most of the visit with lots of baths, TV and access to the supermarket. I have never yet been off without bumping into someone I know, which always serves to remind me that the community we live in here is bigger and wider reaching than just our little island. We arrived home yesterday and Rum was kind to us while we moved cars about and carted shopping up the hill in wheelbarrows, holding off the hail and rain until about an hour after we were safely back indoors. Today has been glorious – a real taste of springtime with sunshine warm enough to have me in my short sleeves outside for a couple of hours over lunchtime. 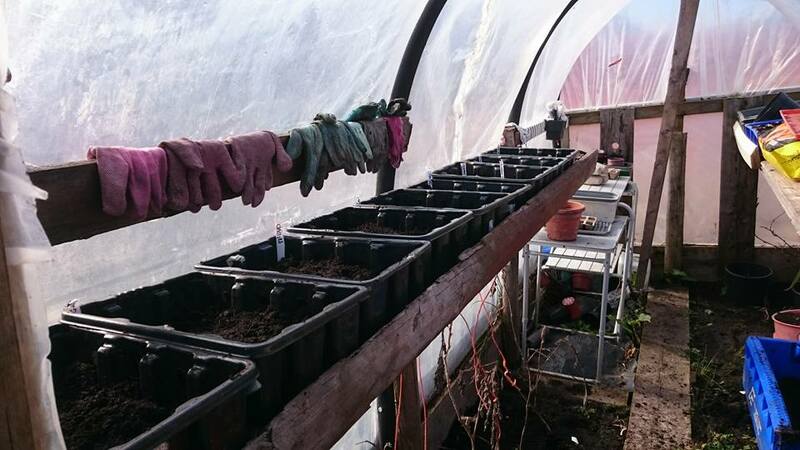 I managed to do my first round of seed sowing: peas, beans, tomatoes, chillies, peppers, leeks, onions, celeriac, asparagus, strawberries and three fish boxes of salad leaves ready I hope for our April filled with guests to have salad. That’s the polytunnel shelves nearly filled with seed trays but I have my four mini greenhouses waiting with new covers to take the next batch of sowing. I did some more weeding of the outside strawberry beds and having taken a peek at the strawberries in the plastic covered beds alongside the polytunnel I realised that despite thinning the plants at the end of last season they have continued to throw out runners and need thinning again. I was in the process of this task (about a third of the way through) when a friend walked past so I chatted to her and her son for a while by which time the late winter sun had already dipped behind the hills and thrown the strawberry beds into shade which called an end to that activity for today. 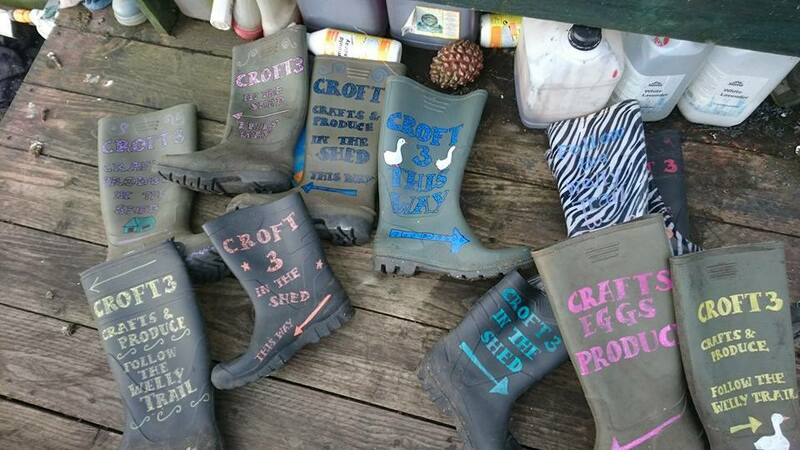 I did managed to drill holes in the bottom of all the odd, outgrown or split wellies I had gathered up last week and washed so that when we hang them up to be part of the welly trail to Croft 3 they won’t fill with rainwater as it can drain out. I also made a start on painting them before the sun dipped too low for the sporran to have sunshine too. At which point I came in for tea, pizza dough making and some dvd watching with Davies. The next few weeks is all about getting ready for the impending season – of visitors to stay with us and of visitors to Rum. 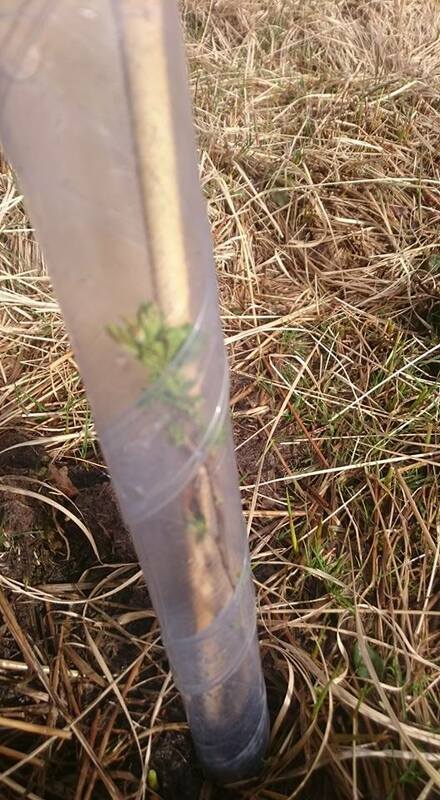 The shed needs to be ready to re open for business and we need to have our share of deliberate crops to begin growing along with everything nature is encouraging to burst into life.